Standalone physical modeling synthesizer app. Is there a better alternative to Kapling? Is Kapling really the best app in Audio category? Will Kapling work good on macOS 10.13.4? Kapling is a simple little standalone physical modeling synthesizer application for Mac OS X built with Max/MSP 5. It is based on the Karplus-Strong algorithm. Kapling uses this method to attempt the emulation of resonant bodies, like a string being plucked, or melodic percussion instrument being struck. Eight independent voices are triggered by a 32-step sequencer, with a variety of parameters set up to help you sculpt new timbres in realtime. 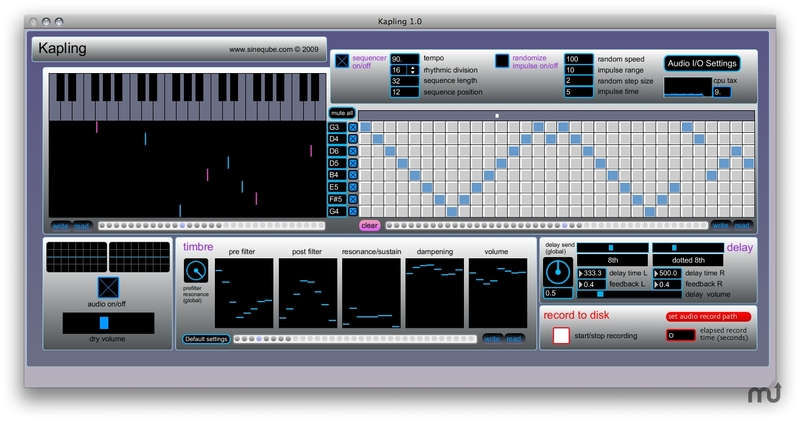 Kapling also features a tempo-synced stereo delay and recording to disk. In simpler terms, Kapling can help you make twangy, boingy, klonky tones. Kapling needs a review. Be the first to review this app and get the discussion started! Kapling needs a rating. Be the first to rate this app and get the discussion started!